Cultivating plants is a wonderful hobby to introduce your kids to, and it may very well grow into a lifetime passion. Young children have limited attention spans, so extended time periods can be meaningless to them. 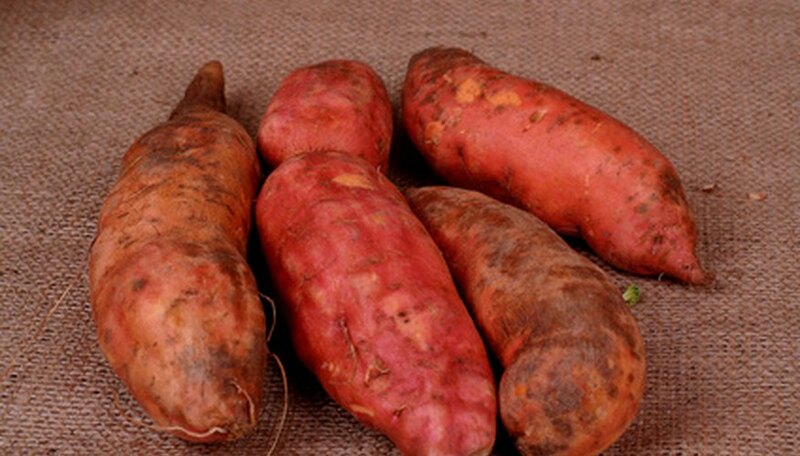 Short-term gratification is very important, and the humble sweet potato can deliver. It’s large and sturdy, making it easy for little hands with fat fingers to manipulate. Vines sprout quickly and grow enthusiastically, encouraging anticipation and interest in the young mind. Your child will be amazed to see new growth spring from a food item, and delighted to see it develop and grow into an attractive vining houseplant. Choose a firm sweet potato with “eyes.” A potato with buds on it will sprout more rapidly than one without them can. Reject any potatoes with shriveled skins or rotten spots. Insert four evenly spaced toothpicks around the center of the sweet potato. They’ll support it on the top of the jar and keep it from falling into the water. Change the water once weekly to prevent it from stagnating and attracting insect pests. Plant the sweet potato in a container of potting soil when each vine has as least four to six leaves. Pull the toothpicks out of the potato and cover it completely with soil. Leave all of the stems exposed. Use a well-draining pot large enough to accommodate it comfortably. A hanging basket is a good choice for this plant’s vining habit. Place it in the brightest spot in your home near a window out of direct sun. Water the sweet potato thoroughly. Don’t soak it to the point of being soggy or wet. Over-watering will cause the potato to rot. Water thereafter enough to keep the soil surface evenly moist. Feed the sweet potato vine a water-soluble 20-20-20 houseplant fertilizer once monthly. Pinch back new shoots to encourage branching and bushiness of the vines. Plant the sweet potato vine outside in May after all danger of frost has passed for your area, if you wish. You’ll be able to harvest your very own sweet potatoes in the fall, adding an exciting dimension to your project.